... is exactly the number of rows left to finish my Dragonfly Wings shawl for the knitalong*. ... is the approximate number of minutes it will take to tink back to the mistake, so I'm going to get on with it. ... is roughly the number of times I have thought about ripping the whole thing out in frustration and starting again from scratch. ... is also the exact number of years since I married D.
I read about a couple who had been married for very many years and when asked for the secret of their longevity, replied that it was really very simple: there were times where one or other of them had wanted to get divorced, but those times hadn't coincided. I can relate. Through some of the most stressful times, when it didn't seem we could make it work, it felt that it might be easier to rip the whole thing apart in frustration than to put it right. *There are two weeks left in the Pick A Boo! 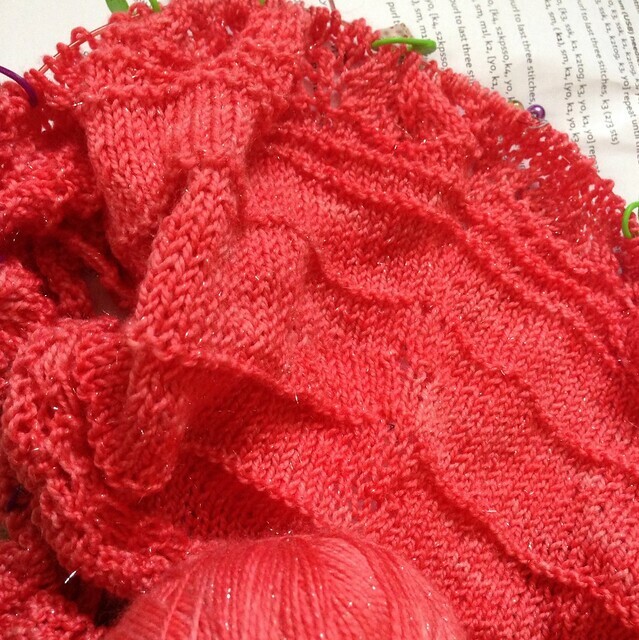 Knitalong, and so it's not too late to join in. Details are here. If you're blogging along, please add your link below. I'm planning to have my finished shawl ready for next week and to show you some of the other gorgeous FOs. Happy knitting! Happy Anniversary, I sure can relate to the bodging to, such a great way to phrase it to. We are married 13 years and yes some bodging has gone on and you just weave the mistakes into the cloth that is marriage and learn from them. Hoping Dragonfly wings works out for you and is so near finished. I think that's the other secret, a marriage is a constant bodge! I married a slightly older man while I was at university and we've been happily bodging for three times as many years as you! Happy Anniversary!! We are celebrating 10 years tomorrow ... by taking the kids to see Smurfs 2, lol. Happy Anniversary to you two! 10 years is certainly an accomplishment. Will you tink back then?